Located between Europe and North America, the Nordic European country of Iceland is a jewel in the Atlantic Ocean. Despite its name, only 10 percent of Iceland is covered by glaciers while the rest is filled with luscious landscapes of sand, lava fields and various geothermal hotspots. Icelandair has an amazing promotion that allows you to extend your stopover in Reykjavik, Iceland for up to seven nights for no additional fare. On my way to London I was able to make the most of this fantastic promotion and arranged a 24-hour layover in Iceland to visit the eclectic and very colourful city of Reykjavik. Although there is much more to see in this beautiful country, with only a day to spare here’s how to make the most of your stopover in Iceland. I arrived in Reykjavik in the afternoon. The airport was a 45 minute bus ride to the city centre where I then checked into my hostel and started exploring. 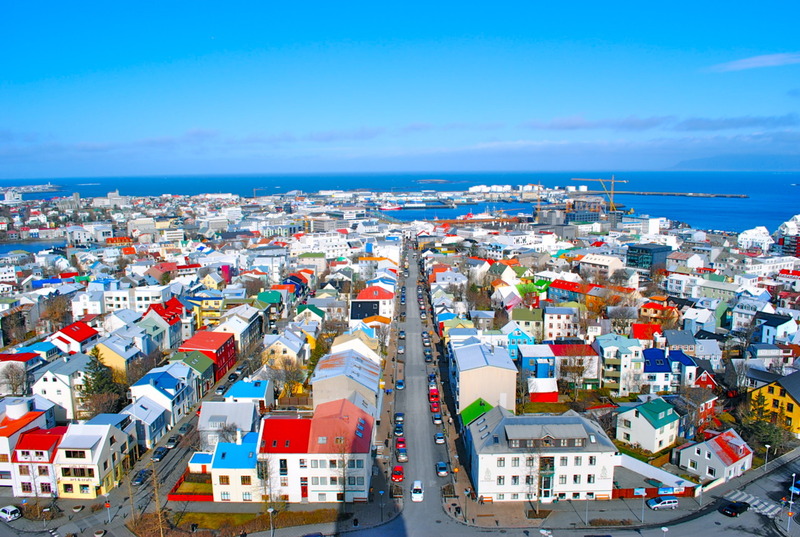 The city centre of Reykjavik is quite concentrated, which made it easy to discover by foot. Wander through Reykjavik’s main shopping street Laugavegur to see the best in Iceland fashion and design. Turn onto Skólavörðustígur to find a variety of souvenir and craft shops before heading up to Hallgrímskirkja, the large church that looms over the city. Built in 1937, the design of this church was commissioned by Guðjón Samúelsson to look like the basalt lava flows which are found all over Iceland. Climb to the top of the tower for a spectacular view of the sprawling city and the ocean. Head back to the main road and travel west towards the Tjornin, a pond at the city centre, which is home to ducks and swans next to the Reykjavik City Hall, Ráðhúsið and the Parliament of Iceland building. You will also find the Reykjavik Art Museum, the National Museum, Reykjavik City Library, National Theatre, the Living Art Museum and the Supreme Court. With three locations across the city, the Reykjavik Art Museum (Flókagata 105) possesses the largest collect of art in Iceland and houses the Erró collection, a Kjarval collection and the Ásmundur Sveinsson Sculpture Museum. Learn about the seaside history of Iceland at the Vikin Maritime Museum (Grandagarður), which features exhibitions on the naval and fishing activities over the years in Iceland and the first steel ship, Magni, built in Iceland docked at the Museum’s pier. With only one night in Reykjavik, hop on a Northern Lights exhibition trip and hunt for a glimpse of the famed Aurora Borealis! The morning before I had to leave for my flight, I decided to wake up bright and early to go to the geothermal spa, the Blue Lagoon (240 Grindavík). It has been said that the warm waters of the Blue Lagoon which are rich in silica and sulfur have rejuvenating powers to help clear many skin conditions. Unwind in their mineral water pools, bathe in the Silica mud and relax in the steam baths. The Blue Lagoon is located almost halfway between Reykjavik and the airport, and after a very relaxing morning I was on my way for my connecting flight and ready to start the rest of my trip. Situated in downtown Reykjavik, KEX is a full-service, social hostel equipped with a café and bar, lounge area, meeting room, old-school gym and heated outdoor patio area for warmer summer days. Fully furnished with a blend of vintage and industrial furniture, this hostel reflects the contemporary and youthful vibe of Reykjavik. With options for four, six, eight, 10 and 16-person dorm style rooms, single and double occupancy rooms, family rooms and double room plus (offering all the hotel services and amenities), there is a room that will meet all of your needs. KEX is a shining example of Icelandic hospitality as they can pre-arrange your airport transfer, which offers visitors easy and accessible door-to-door service. Their knowledgeable front desk staff supplies a wealth of tourist information to help better plan and coordinate your stay in Iceland. There is also a free luggage storage area which is very useful for visitors wanting to make the most of their short stay in Iceland. Don’t miss their exquisite breakfast buffet where you can taste traditional Icelandic porridge and other tasty morning treats. Skyr: Icelandic soft cheese yogurt served in a variety of flavors including some berries unique to Nordic countries. Icelandic fish: with its long costal fishing history, there are a variety of fresh, locally caught fish to try. Saltfiskur(salt-fish) has been a staple in Scandinavian diets for over 500 years and Harðfiskur (stock fish) is a dried fish that is served best with butter. Hangikjöt: smoked Icelandic lamb often serviced withpotatoes, béchamel sauce, red beets and green peas. Kjötsúpa: traditional lamb meat soup boiled withrice, potatoes, turnips, carrots, onions and herbs. Pylsa: The unique flavor of the Iceland hot dog is because it is made out of lamb (instead of the North American all-beef) and served með öllu (with everything on it)with ketchup, sweet brown mustard, raw and fried onions and a sauce made of mayonnaise and relish called remoulade.